There are plenty of reasons for professional users to like the LM5360HXAR-HST-PRO lawnmower. The LM5360HXAR-HST-PRO is fitted with a newly designed and developed hydrostatic gearbox by Kaaz. This gearbox gives the mower fantastic speed control. The speed can be set from 1.0m/s up to 1,8m/s, making it the fastest commercial roller market on the market. The DANARM LM5360HXAR-HST-PRO is fitted with a heavy steel rear roller, leaving a beautiful and traditional striped finish to the lawn. The full width roller lets you mow up to the edge of borders. The split differential drive prevents slipping on damp ground and prevents scapling of the lawn when turning. The Blade Brake Clutch system allows you to stop the blade whilts the engine remains running. This allows you to empty the 75 litre collection bag without having to restart the engine or drive the mower over garden paths and gravelled driveways. There is a lot going on underneath the heavy duty aluminium die cast deck of this machine. It is reinforced with a replaceable steel liner and benefits from protective side strips. 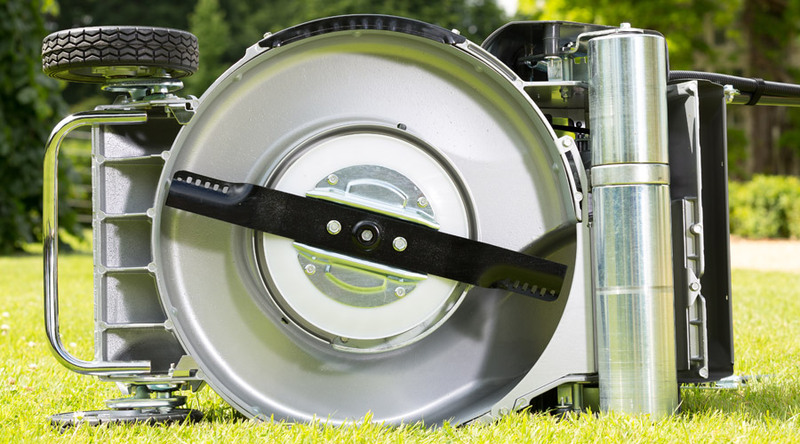 Fitted above the blade is a powerful fan that helps greatly with collection in damp conditions and improves the finish of the lawn by lifting the grass blades before they are cut.